Patti Smith at the Newport Folk Festival in 2016. When “Just Kids” was published in 2010, it was a revelation to many who admired its author, Patti Smith, as a rock ’n’ roll performer, songwriter, and perhaps a poet, but had no idea she was capable of such masterly prose. The book, a memoir of her remarkable relationship with photographer Robert Mapplethorpe, went on to win the National Book Award for nonfiction and establish Smith as much more than “the keeper of the phlegm,” as she was called by at least one clever headline writer in her punk heyday. In 2015, Smith published a second affecting — and best-selling — memoir, “M Train” and is back now with “Devotion,” a slender volume that attempts to explain, however obliquely, her approach to writing. Smith will talk about the book Sept. 28 at the Back Bay Events Center. An odd amalgam of fact and fiction, “Devotion” was actually an assignment. Smith was invited to talk about her writing process as part of the Windham-Campbell lectures at Yale University and develop an essay based on her talk. That she didn’t exactly follow the rules — “Devotion” is not an essay — should surprise no one. Over e-mail and in conversation, Smith, who turned 70 this year, is modest and unaffected. Despite a publicist’s admonition that questions be restricted to the new book, Smith seemed content to talk about anything, including music, the agony of losing important men in her life — playwright and actor Sam Shepard being just the latest — how writing has become the central focus of her life, and her improbable status as a pop-culture icon. Celebrity is not something Smith ever sought, either in her early days as a poet and performer with the Patti Smith Group or more recently as a writer. 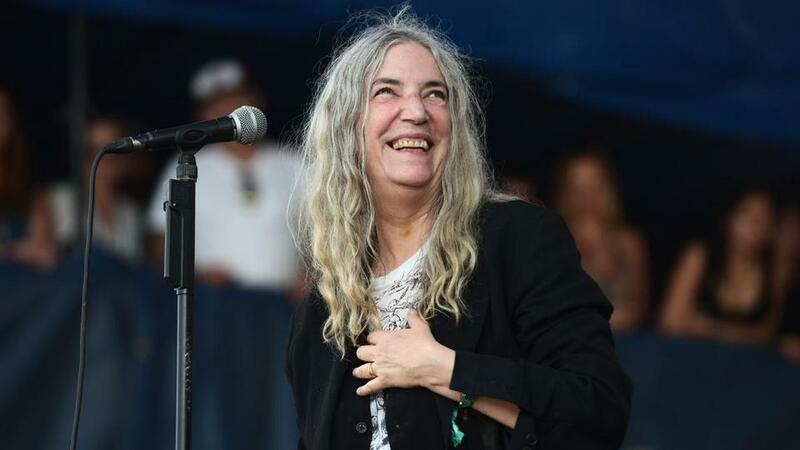 Indeed, she withdrew from the public eye for more than a decade — from 1980 though the early ’90s — when she and her husband, former MC5 guitarist Fred “Sonic” Smith, moved to Detroit and focused on raising their two children. But even when she wasn’t around, Smith was still working, writing fairy tales and other fiction, none of which had ever been published. In 1994, her husband died of heart failure at 44, and a couple of years later Smith returned to New York City. For reasons both emotional and practical — she can’t drive — Smith said she couldn’t stay in Detroit. She soon resumed performing with Lenny Kaye, the guitarist and principal songwriter in the Patti Smith Group, and continued to write. The short story included in “Devotion” is a tale of obsession involving a young figure skater who’s prized and ultimately possessed by an older man. It’s a fable that in style and substance feels very European and owes much to Smith’s literary idols, writers like Albert Camus and Jean Genet. Whatever anyone thinks of it — The Washington Post called it “weak sauce . . . folktale claptrap” — Smith doesn’t much care. Smith finds writing fiction very different from writing lyrics: One comes easily and one doesn’t. The problem with lyrics — “Because the Night” and “Gloria” are two of Smith’s best-known songs — is that she feels responsible to someone other than herself. “I write lyrics to sing to the people or to serve a piece of music that I’ve been given by my husband or by Lenny Kaye,” she said. “When I’m writing poetry or fiction, my responsibility isn’t to the people, it’s to the work itself. As onerous as it is, Smith said she’ll be writing lyrics again soon because she and her band plan to record another album. In her life and career, Smith has had many triumphs — being published in the United States by Alfred A. Knopf and in Europe by the revered French publishing house Gallimard is one of her proudest achievements — but she has also suffered much loss. Lately Smith has been coping with the July death of Shepard, with whom she collaborated on a play (“Cowboy Mouth’’) and had a tumultuous romantic relationship in the early ’70s. (He was married at the time.) For decades, Shepard was a steady presence in Smith’s life through a series of personal tragedies. Smith sighed. She said she intends to carry on doing what she’s always done.